The parents of schoolboy Rhys Jones took their place in court for the first day of the trial of the teenager accused of their son's murder. 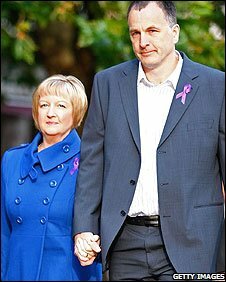 Stephen and Melanie Jones arrived at Liverpool Crown Court for the trial of Sean Mercer, 18, who is alleged to have shot 11-year-old Rhys in August 2007. Mr Mercer, of Good Shepherd Close, Croxteth, Liverpool, denies murder. Three men and three youths who are charged with assisting an offender also deny that charge. Rhys's parents were accompanied to court by police family liaison officers. The three men charged with assisting an offender are James Yates, 20, of Dodman Road, Gary Kays, 25, of Mallard Close, and Melvin Coy, 25, of Abbeyfield Drive, all in Croxteth. The three others charged with the same offence are teenagers aged 16 or 17 who are too young to be named. Rhys was shot as he walked home from football practice near his home in Croxteth Park on 22 August last year. The trial is expected to last between six and eight weeks, with the first few days likely to be taken up by legal argument.